posted by calgarygrit at 9:53 p.m. This is very important set of elections for Canada and the USA. Basically, the US is finally in a position to rid itself of the fascists that have gripped the White House, and for Canadians, its our opportunity to get rid of the Bush fellow travellers in the PMO. Defeating fascism, or "excessive centralized control"; is the key to restoring democracy in the USA and Canada, and to end the era of abuses to the "rule of law" and its associated war mongering. Nothing is more important, then ridding the world of this scourge, this latent rebirth of Nazi Fascism in North America, complete with its racism, brutality, lawlessness, and torture. We are going to see President Obama and Prime Minister Dion, renegotiate NAFTA and bring about real change on critical environmental issues, including the belated restoration of the Kyoto targets for Canada. As for the Progressive Conservatives, we are going to see John McCain restore the Republican Party to its rightful owners going back to Ike Eisenhower before Barry Goldwater and his group of extremists took over the party, much like David Orchard and Joe Clark are going to restore the Progressive Conservative Party to its rightful owners in Canada. You cannot be too harsh when it comes to dealing with fascists, either Canadian or American fascists. History teaches that the only good fascist is a dead fascist. By Joe Green, at 11:03 p.m.
^-- And that's what I would say if I were a crazy guy ranting on a street corner. By The Invisible Hand, at 2:20 a.m. I'm curious how historic this election could be. I think the timing has the makings of a 'big' one - the 21st century will be obviously pivotal in the future of the world, and the future roles of nations, and this election, campaigned simultaneously to Obama and McCain's race and its themes, has more than enough potential to decide Canada's ambitions, goals, and direction in that new world order. But our "leaders" aren't going to go there, and will play it safe. So while it will likely be a crazily fun election for us all, it will not be historic. We put a man on the moon - I believe we can eliminate the need for competition for energy in this century, and find cheap and plentiful and green sources. I think we may see a replay of the clash between communism and capitalism, between collectivism and individuality, in this century, but not a Cold War - instead, a relatively amiable competition between America and an increasingly free and middle class China. I think Canada is a country that strikes a fantastic balance between communitarianism and individualism. I've lived all over Canada, and it's hard for me to realistically imagine a better society to live in than Canada. I think there's a valuable role we can play in helping ensure than any new "Less-Cold War" between these two ideas and nations is a peaceful and less suspicious one. We are not the future, but we can play a vital role, I do believe it's possible, in helping the future play out peacefully and respectfully. But this election will be fought on smaller, less visionary ideas - tax cuts or new taxes, more or less provincial red-tape, Quebec, etc. More of the same, but with less separatism. By Jason Bo Green, at 2:23 a.m.
God, I hope so. John McCain is sooooooo worlds better than GWB. God do I wish he'd been President the last 7.5 years. I'm no political scientist, but I think Eisenhower must surely be rolling over in his grave. By Jason Bo Green, at 2:25 a.m.
"^-- And that's what I would say if I were a crazy guy ranting on a street corner." I'm sure that he doesn't mean you. By JimTan, at 5:13 a.m.
"History teaches that the only good fascist is a dead fascist." Is this a joke? An attempt at satire? By JimTan, at 5:16 a.m.
Turner came close in '88, even though he was crippled and "not a leader". How? By making it all about a single issue. Dion needs to make this election a referenhdum on the green shift. By CW, at 3:04 p.m.
What? But it was the first socialist government in North America? I'm a Liberal, but Tommy Douglas is my hero..
By Sophie-Marie, at 5:48 p.m.
1. Little different from centre-left liberal governments (eg. BC NDP except for Barrett, who led the province for all of 3 years). 2. Completely ineffectual (eg. Bob Rae). The much-vaunted accomplishments of the federal NDP regarding medicare are overhyped. Diefenbaker, with a majority government, instituted the Hospital Insurance and Diagnostic Services act, which funded a large proportion of healthcare costs for provincial governments that provided healthcare. When Pearson went further, he did so in part, responding to recommendations of a Royal Commission Diefenbaker had ordered. The narrative that the NDP held a gun to the heads of the Liberals simply doesn't stand. Indeed, in the 1965 election, the Liberals had promised to implement a national medicare program by July 1st, 1967. By hosertohoosier, at 8:08 p.m.
Barrett's government changed BC forever - see ICBC, among other things, and it's ridiculous to suggest that NDP/CCF governments in Sask and Manitoba were "little different from centre-left liberal governments". 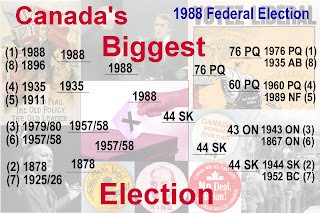 In any case, I'd be a lot more keen on the CPC were it led by Tories of Dief's era. By Josh G, at 9:54 p.m.
By Data recovery software, at 2:21 a.m.
By elkamaal elkamaal., at 5:05 p.m.
By elkamaal elkamaal., at 5:06 p.m.
By elkamaal elkamaal., at 5:07 p.m.